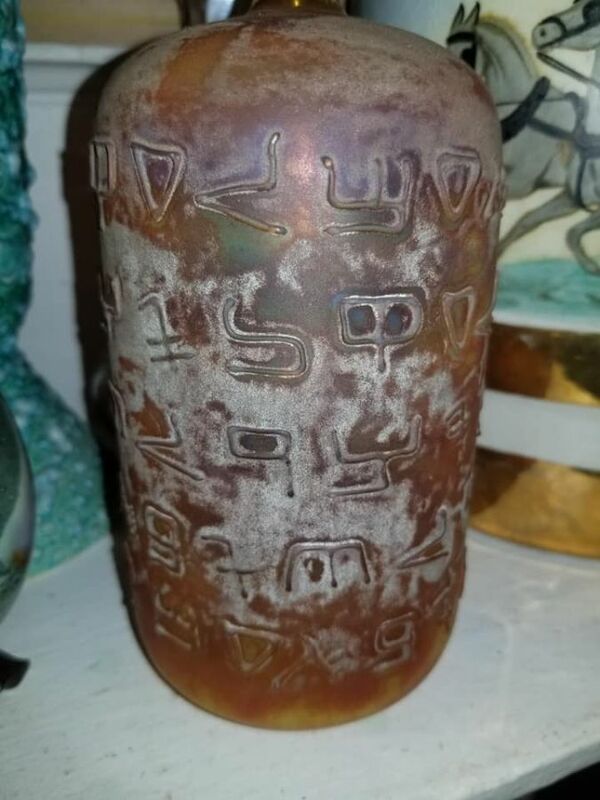 Very Unique Long Neck Amber Vessel with Greek Letters Applied - Real or Not? I bought this vessel in Columbia, SC over the weekend. The dealer I bought it from just listed it as an old bottle with no specifics. I bought it because I liked it and it is so unique. It may or may not be old. Here is what I do know. It is 11” tall. The glass is very thin – much too thin to be made in a mold. It weighs about 4 ounces. 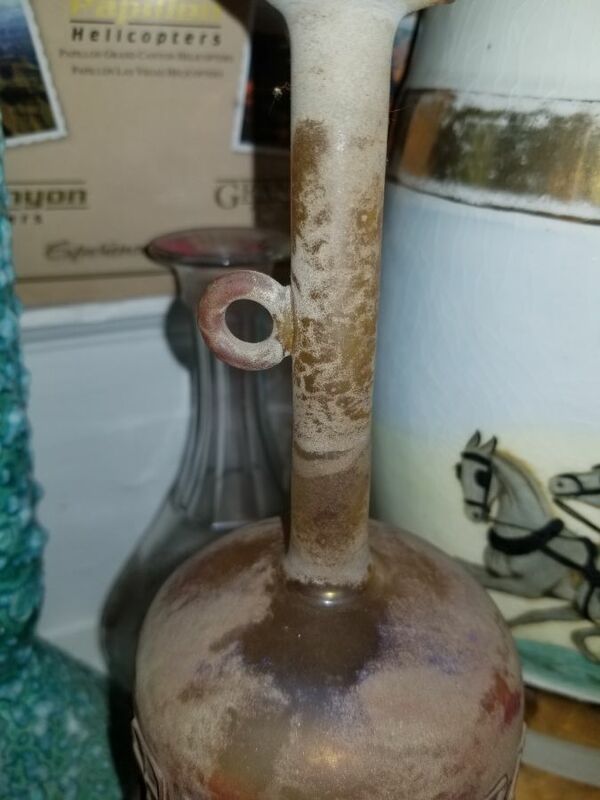 The bottom has clear glass with a small pontil mark and what appears to be an etched circle with initials on the bottom. The lettering appears to be ancient Greek – I am not sure. Each letter has been hand applied. 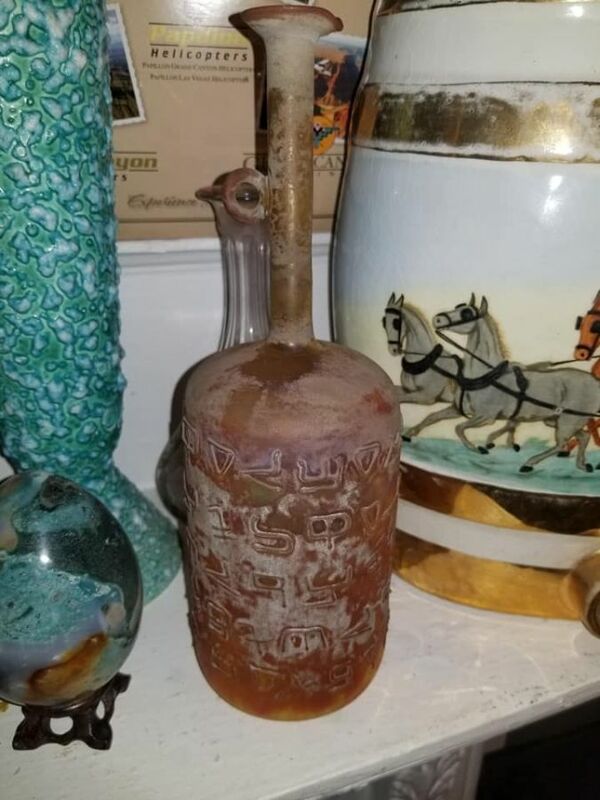 If anyone is familiar with type of bottle or has seen one before I would certainly appreciate hearing from you. Any other feedback or comments would also be welcome. This is a modern piece. I have seen some replicas of ancient glass, complete with aging, that are scary convincing. The Corning Museum had a great exhibit of such pieces, not sure if it was a temporary or permanent display. If you have never been there, consider a visit. I don't see any Greek letters . . . at least, no Cyrillic Greek. Thanks to both! Greek is the closest thing the letters resemble even though they aren't a perfect match. I have always wanted to go to the Corning Museum.